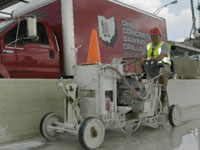 ABC Concrete Sawing and Drilling founded in 1981. We offer a variety of services including sawing, drilling and coring, grinding and polishing, and a wide range of specialty services. Locations: Pompano Beach, Florida, Nashville, Tennessee and surrounding areas. ABC Concrete Cutting, Inc is currently accepting applications for operator positions. If you are interested in this or any other career with ABC Concrete Cutting, Inc please fill out the form below and forward your resume/questions. Good Driving Record: No D.U.I. - 4 points maximum. Positive Attitude: Do you usually have a smile? Mechanical Skills: Have you done some work on your own car or motorcycle? ABC Concrete Cutting, Inc doesn't require expert mechanics, but you should be comfortable with tools. Neat Appearance: Do you take pride in your own appearance? Do you keep your car clean? Drug Free: Applicants must pass a drug test. Hard Worker: Do you get personal satisfaction out of hard work and completion of assignments? Independent: Are you comfortable working on your own without close supervision? Competitive: When you were in school did you participate in athletics? (Football, Wrestling)? Most employees of ABC Concrete Cutting, Inc will make more than $30,000.00 in their first year, $35,000.00 in their second year and fully trained operators often earn in excess of $50,000.00 annually. ABC Concrete Cutting, Inc offers starting pay up to $18.00/hour for experienced operators. An ideal applicant has these attributes!